There’s so much to do at Kielder Water & Forest Park, the choice is yours. There are many reasons to visit; the most popular being the distinctive scenery. Home to northern Europe’s largest man-made lake and England’s largest forest, the Park’s remoteness and clean air and water offer a fresh outdoor experience. Kielder Water & Forest Park is also an ideal base for exploring the rest of Northumberland, Cumbria, Hadrian’s Wall Country and the Scottish Borders. Fancy getting off the beaten track and away from our main visitor centres? Discover our best unspoilt and hidden views – the areas you can claim for yourself. Why not take a picnic to one of many picnic spots as you stop to admire the view? After lunch take a trip to the Kielder Water Birds of Prey Centre. There are daily demonstrations so check the time of those on arrival to the Park. If you want more of a ‘behind the scenes experience’ why not try a Hawk Walk or an Introduction to Falconry course (must be booked in advance – 01434 250 400 ). On a Hawk Walk, the hugely experienced centre staff will give you basic training before the walk commences. Spend around an hour and a half walking in the surrounding countryside with a Harris hawk, flying it and watching it swoop down to take food from your fist. Numbers are limited to give you that extra special, personal experience. Choose from a range of B&Bs, the extra special Falstone Barns or the luxury lodges at Leaplish Waterside Park. For a special evening treat, why not check if there are any events on at Kielder Observatory where you can spend the night star gazing under the darkest night skies in England. Did you know Kielder Forest accounts for 25% of England’s timber production and fifty lorry loads of timber a day leave the forest? Check event listings or call Kielder Castle (01434 250 209) to see if you can take part in a Working Forest Open Day. This is an unmissable opportunity to go behind the scenes and find out how England’s largest forest is managed as well as getting ‘up close and personal’ with some monster timber harvesting machines. Spend the afternoon discovering Kielder Water & Forest Park with the wind blowing through your hair. This rugged wilderness is a mountain biker’s heaven. There’s so much to do at Kielder Water & Forest Park, the choice is yours. There are many reasons to visit; the most popular being the distinctive scenery. Home to northern Europe’s largest man-made lake and England’s largest forest, the Park’s remoteness and clean air and water offer a fresh outdoor experience. 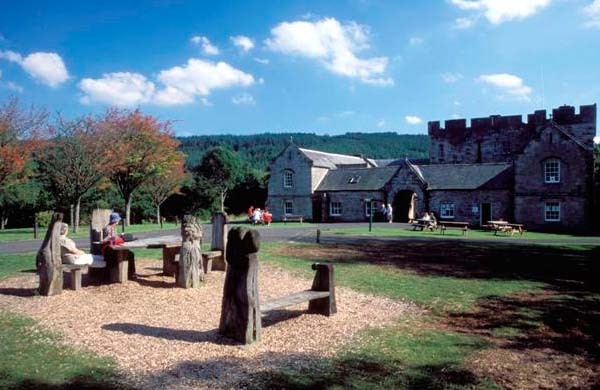 Kielder Water & Forest Park is also an ideal base for exploring the rest of Northumberland, Cumbria, Hadrian’s Wall Country and the Scottish Borders. Experience some of the best single track trails in England and some of the best views in Britain. There is a 14.2kilometre blue graded trail which opens up the vast landscape to casual and intermediate riders and a tougher 18.7kilometre red route which is guaranteed to get pulses racing. Use our trial area to test out the various difficulties of the routes and see which coloured route is best for your ability.